I have three awesome websites to share with you today. And, yes, I found them on Pinterest! So, thank you Pinterest for helping me expand my Genealogy Toolbox. 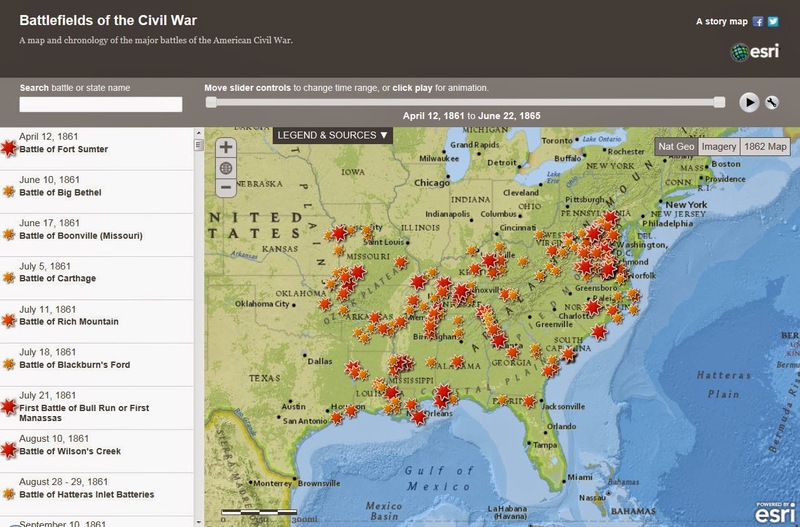 This first website is great for those of us who have Civil War ancestors, or for those who are simply interested in Civil War history. 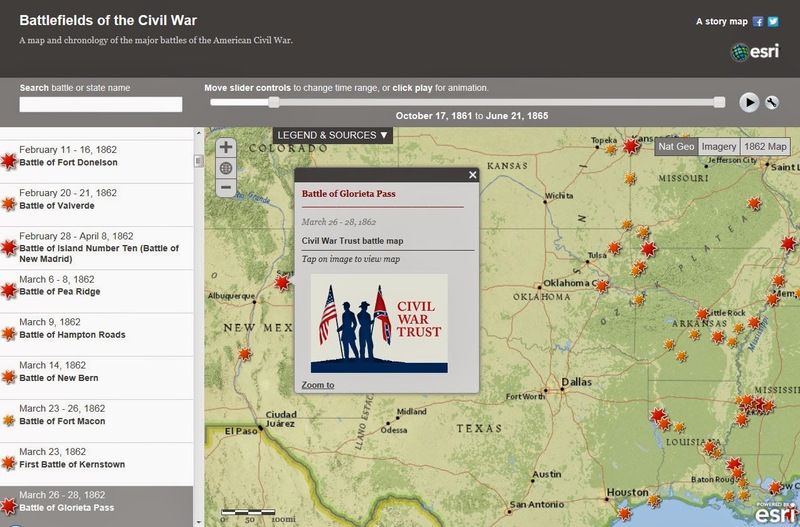 Battlefields of the Civil War is a very cool website. 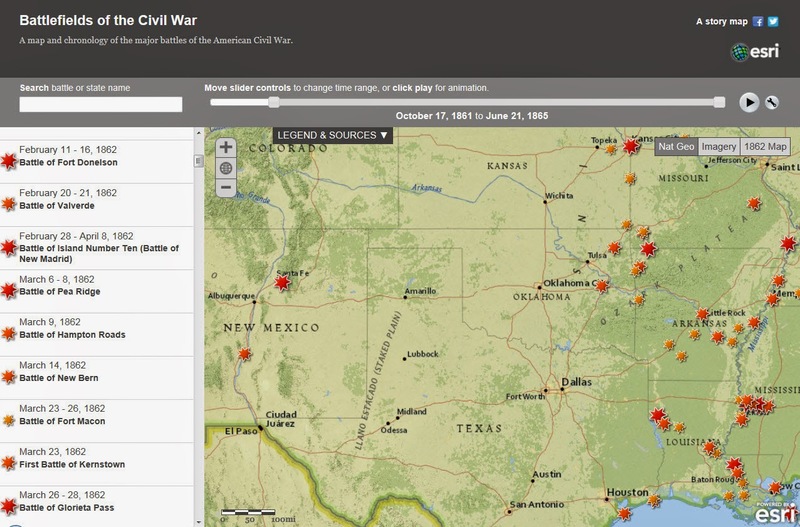 It's a map and chronology showing the major battles of the Civil War. It even has an animation feature. Press the play button to see what happens. Here’s a screenshot of the website’s start page. There is a slider bar at the top. You can even grab the left and right slide handles to narrow down the dates enabling you to see what battles were fought within a specific timeframe. Hmm, I didn’t know there were Civil War battles fought in New Mexico. Let’s click on one of those battlefields. 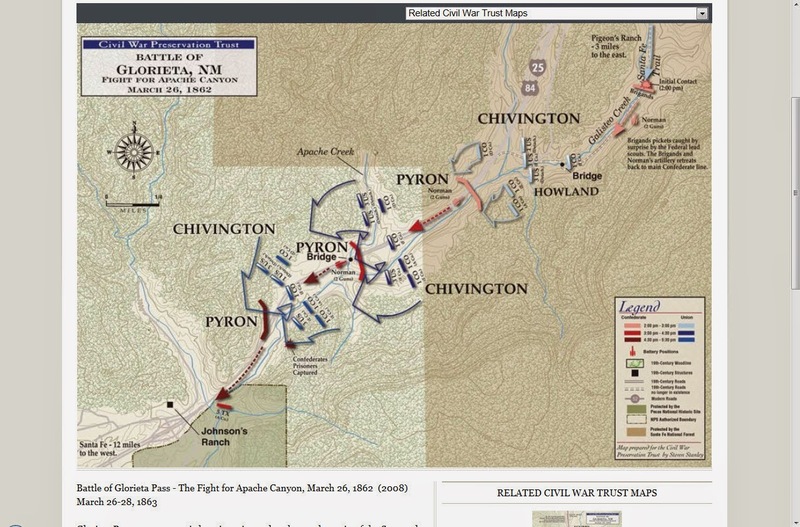 The Battle of Glorieta Pass has a link to the Civil War Trust website. And after clicking on the Civil War Trust link for this battlefield, this is what you see. There is information about that specific battle. 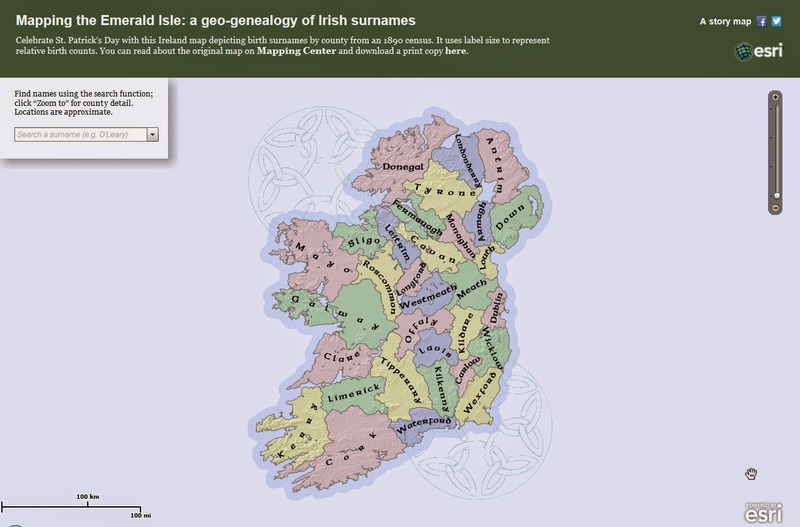 Mapping the Emerald Isle: a geo-genealogy of Irish Surnames is another awesome website for those who are researching Irish ancestors. 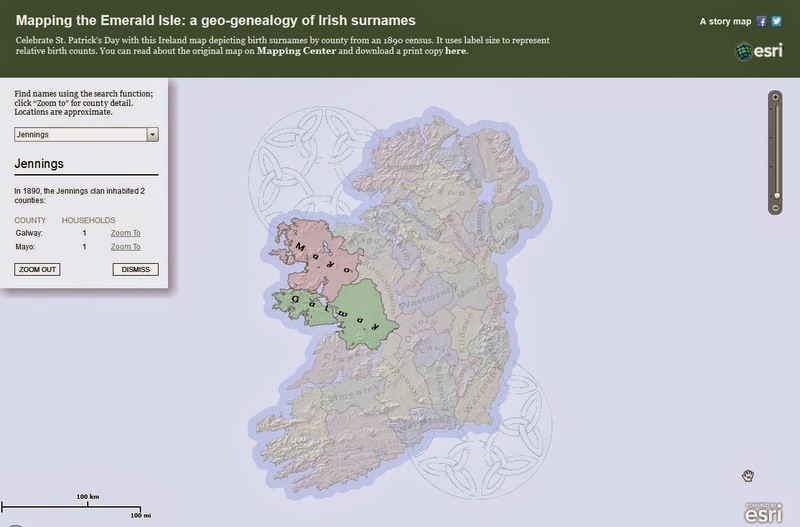 This website shows birth surnames by county from an 1890 census. Here’s the start page for this website. Simply type or search for a surname on the dropdown menu at the left. Here’s what I found with the Jennings surname. 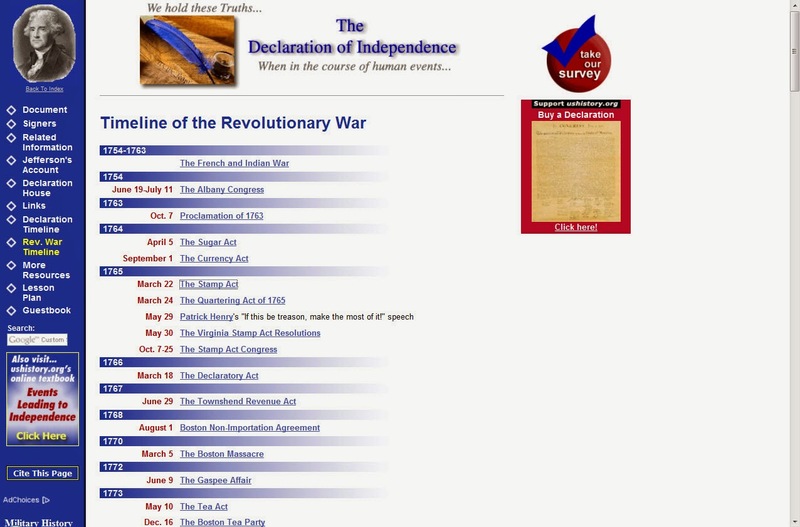 Timeline of the Revolutionary War is a helpful website for those wanting to learn about the Revolutionary War. 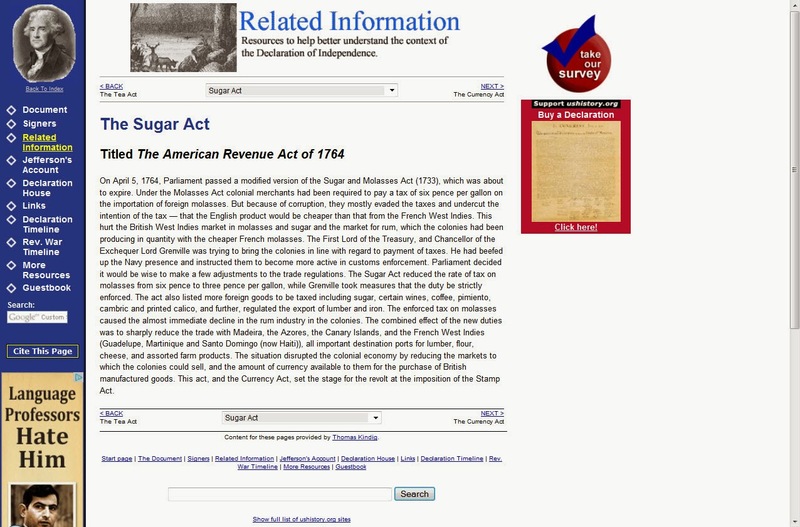 Let’s say you want to learn more about The Sugar Act. Just click on the link in the timeline, and this is what you will find. Well, that’s it for today’s tips. 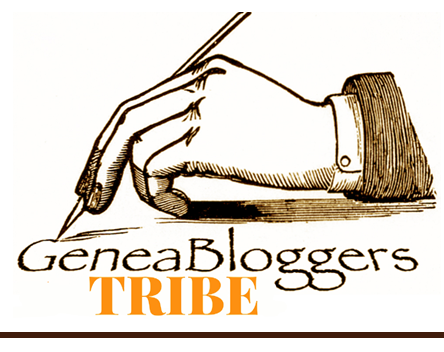 I hope these three websites will be helpful to you in your genealogical pursuits. And thank you Pinterest for making me aware of these awesome websites! 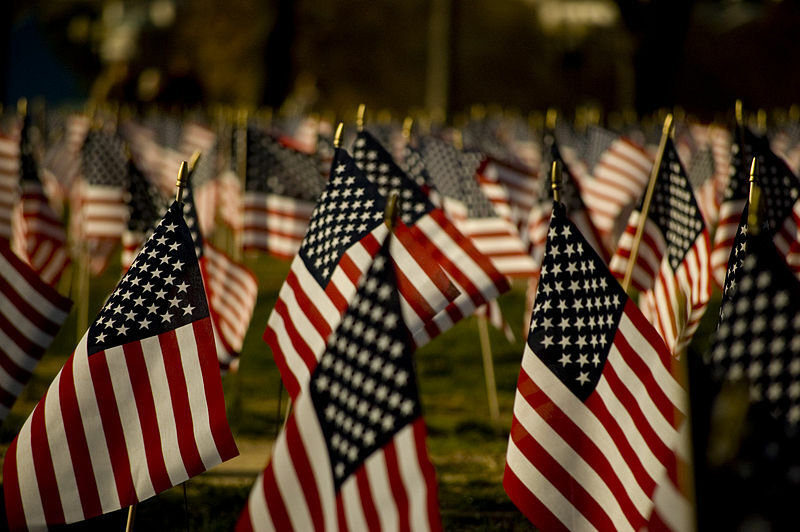 In commemoration of Veterans Day, I wanted to take the opportunity to thank all of the members of the military who have selflessly served their fellowmen and this great country, the United States of America. I also wanted to list my ancestors who have contributed to keeping these United States a free nation. There may be some I missed because I am not aware of their service at this time. If that is the case, I hope to update this list later. 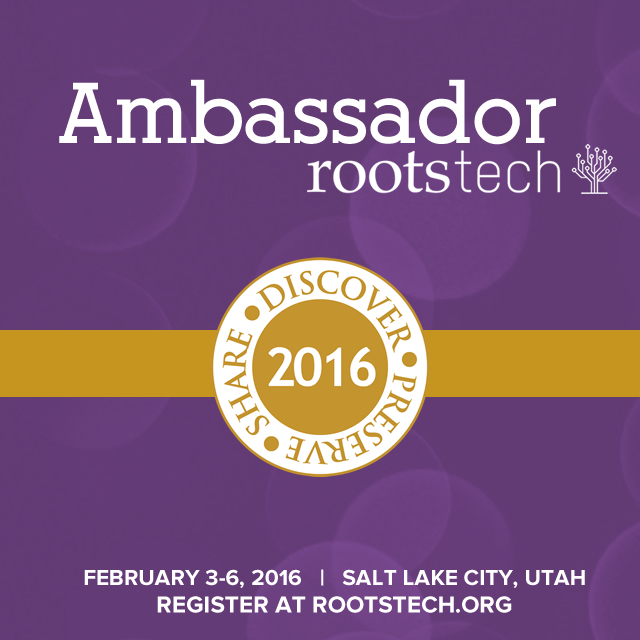 Asher Waterman – (3rd Great-Grandfather) – Capt. Nehemiah Gregory’s Company, Ohio Militia Regiment. Ebenezer Perry Carlisle Webster– (2nd Great-Grandfather) – Co. E, 74th Illinois Infantry Volunteers. Watson Emery Webster – (2nd Great-Grand Uncle) – Co. E, 74th Illinois Infantry Volunteers. Homer Clark Waterman – (2nd Great-Grand Uncle) – Assistant surgeon of the 4th West Virginia Infantry and in the 2nd West Virginia Infantry. Charles Wesley Waterman – (2nd Great-Grand Uncle) – Co. I, Ohio 116th Infantry. Lawrence C. Crippen – (Husband of my 2nd Great-Grand Aunt Lucy Mae Waterman) – Co. A, 92nd Ohio Infantry. Richard Engle – (Husband of my 2nd Great-Grand Aunt Sarah Amanda Waterman) – Co. G, 63rd Regiment Ohio Volunteer Infantry. Jan Albert Iverson – (My Father) – SP4 U.S. Army. The photo below is of my "Traveling Dentist" Great-Grandpa Watson Emory (Frederick) Webster at work in a dental office. Those cute little kids with him are my Grandpa Debs (far left), Edna Lillie (far right), and Carlota (in dental chair). This photo was taken in Brinkley, Arkansas. It is dated January 10 – April 10, 1922. I find the dates interesting. Why was he there only from January 10 - April 10, 1922? And why was he in Brinkley, Arkansas? My regular readers may have seen from my previous posts that I sometimes like to "break down" photos into smaller sections by cropping out certain areas of interest. This photo has quite a few areas of interest to look at. Here’s Great-Grandpa Frederick with dental instruments in hand ready to go to work! Notice the open window behind him? Nice view, huh? This close-up shows my Grandpa Debs and his big sister Carlota. These two were the only children of Frederick and Esther Webster’s five children who lived to adulthood. This is a very special photo of sweet little Edna Lillie, because according to my records, she passed away the next year in 1923. Wasn’t she a pretty little girl? Next up we’ll spotlight some interesting items in the dental office. According to the wall clock, it’s about 10:45. And from the sunlight shining through the windows, I’d say it’s about 10:45 in the morning. Let’s take a look at the table by the window. See all of the dental instruments? Could this be a suction bulb on the table? If so, I wonder if this is an antique version of today’s dental suction tube they stick in your mouth so you don’t drown or embarrass yourself by slobbering all over. When my kids were little, they went to a Pediatric Dentist. At that office, they called the suction tube "Mr. Thirsty." I wonder if this antique suction bulb was a 1922 version of "Mr. Thirsty." And here we have the dental chair. Quite an antique by today’s standards! After taking a closer look at this chair, I noticed a couple of fascinating features. First, I noticed the hand crank on the side. Isn’t that interesting? I wonder what it was used for. Could it have been used to recline the chair? Any other ideas? I also see that there are one or two levers, each with a flat top edge on them, extending from the back of the chair. I wonder if they were used by the dentist to lift and lower the chair. And no, I’m not trying to give you nightmares with these last two photos. See the small motor, and the drill hanging down to the left? I wonder if this dental drill from 1922 made the same unnerving high-pitched whirring noise as the drills of today. Well, this concludes our tour. I hope you’ve enjoyed your virtual visit to a 1922 dentist’s office! And hopefully the last two photos weren’t too distressing. If they were, and you feel the urge to run screaming from the room, I don’t blame you. But, before you bolt, take a deep relaxing breath, and check out what the other Sepia Saturday participants have written about this week by clicking HERE. In a previous post, I introduced you to Sarah Amanda Waterman, my 2nd great- grandaunt, who lived to be 103 years old. 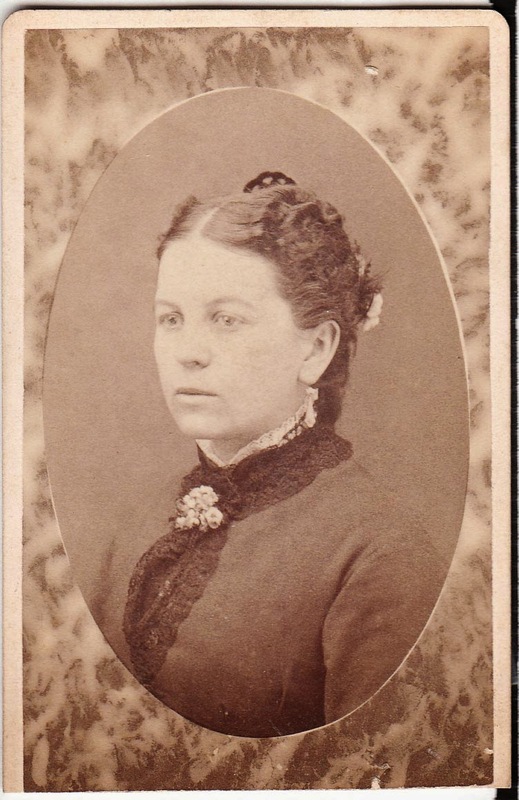 She was married to Richard Engle, a Civil War soldier. Today, I’d like to introduce you to one of Sarah and Richard’s daughters, Ella Eliza Engle. Ella’s death certificate states she was a retired school teacher. And according to the obituary for her mother, Sarah, in the South Pasadena Review newspaper, Ella was also the principal of the Marengo School in South Pasadena. Ella passed away on December 10, 1951 in Los Angeles, Los Angeles, California. She was 93 years old at the time of her death. Ella’s grave is located at Forest Lawn Cemetery in Glendale, California. 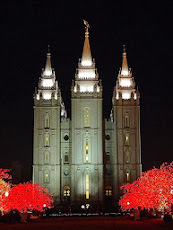 If you’d like to view Ella’s FindaGrave.com memorial page, just click HERE. Today’s Sepia Saturday photo prompt (at bottom of post) shows men in hats playing the Irish sport of "hurling." I don’t have a photo in my collection showing this unique Irish sport. But I did find these two vintage postcards showing men in hats at a sporting event. The two vintage postcards I'm sharing with you today are from my Webster Grandparents’ collection. In 1955, Grandpa Debs and Grandma Willis Webster took a trip to Mexico. Why a trip to Mexico? One very important reason was to visit Debs’ sister, Carlota Webster Guerrero, who was living in Mexico City. 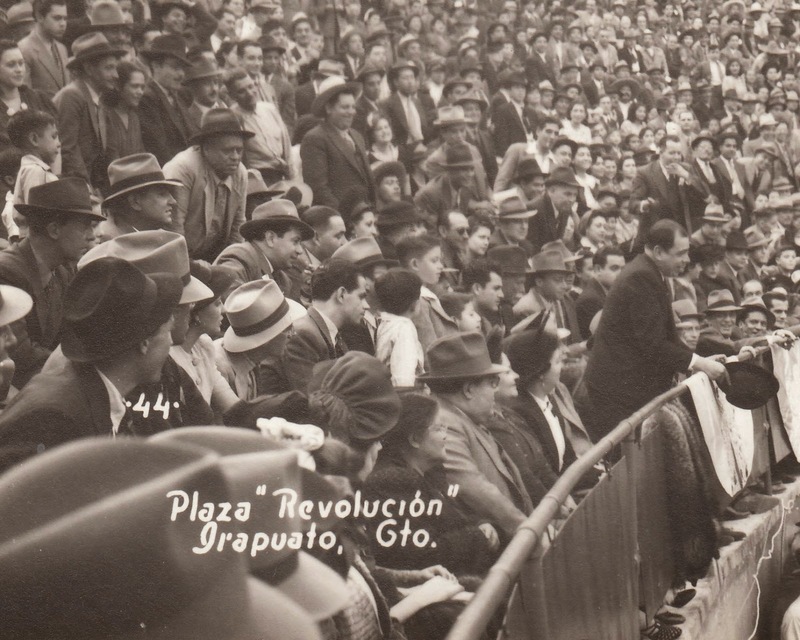 While they were in Mexico, my grandparents visited Irapuato, which is a city in the state of Guanajuato. Again comes the question, why? Why visit Irapuato? Well, it turns out my "Traveling Dentist Great-Grandpa Frederick Webster" and his son, Debs Webster, once lived in Irapuato. For those new to my blog, Frederick Webster was my Grandpa Debs’ father. It looks like Grandpa Debs wanted to visit where he had once lived, however briefly, as a child. The two vintage postcards below show many men in hats. 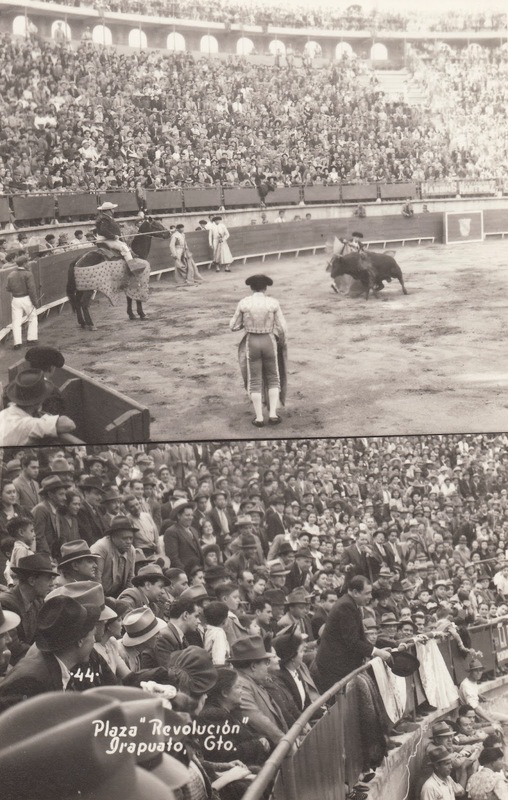 And they show the sport of bullfighting. And while I've never actually been to a bullfight, I’m quite sure I’m not a fan of this sport. I just don’t like the whole concept of it. But, for some reason my grandparents bought these postcards in 1955. Who knows? Maybe they attended a bullfight. 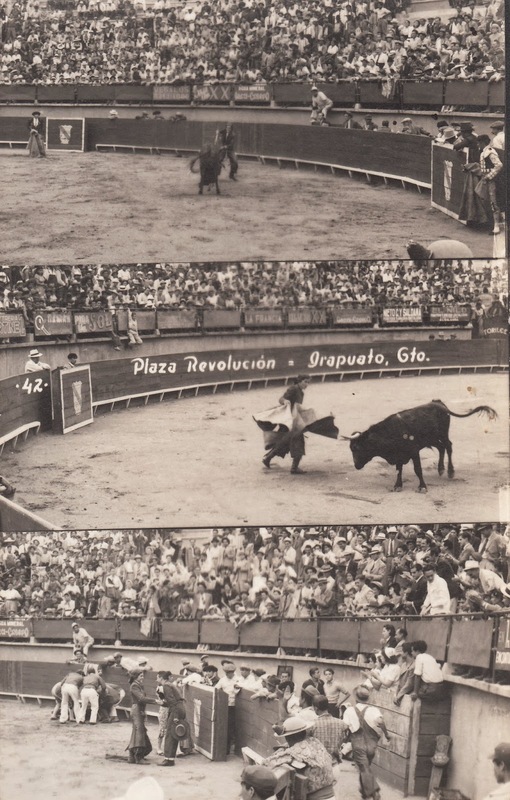 The interesting thing about this first postcard is that it looks like the bullfighter is a woman. 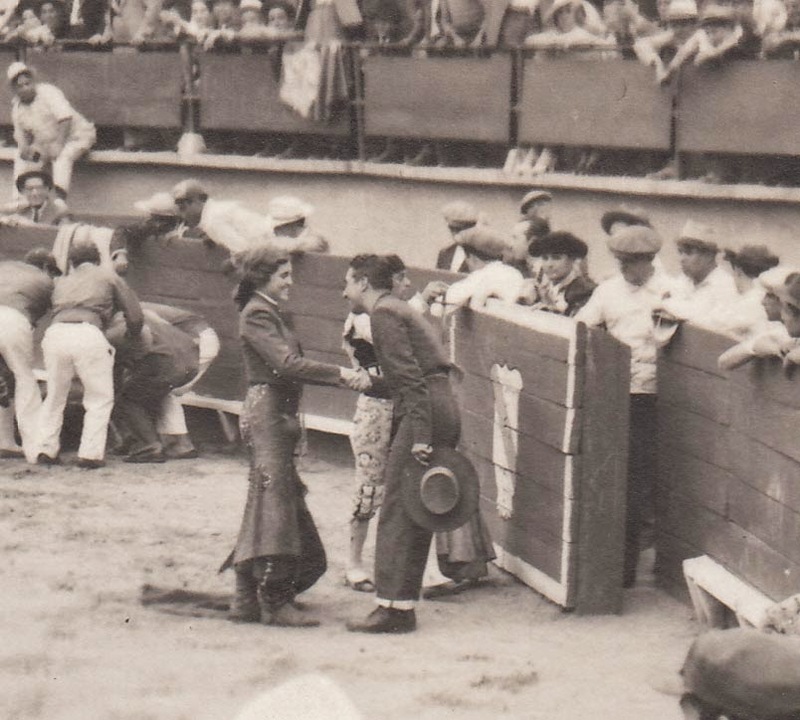 ﻿Here’s a close-up view of the woman bullfighter. And here’s the other vintage postcard. Here’s a close-up view showing lots and lots of men in hats…and a woman with a bonnet too! Can you spot the bonnet? To see more posts of men in hats, sporting events, random bonnets...or anything else our super Sepia Saturday participants have written about, just click HERE.